This afternoon Teena and I headed to the Theatre Centre to see their latest production, Flashing Lights. “In the future, everyone will be famous for 15 minutes.”- Andy Warhol? Flashing Lights tells the tale of Peter, an unremarkable guy who inexplicably becomes famous. His dizzying rise and fall effects everyone around him, in particular his family; his savvy wife Shannon and their child Ter. What starts off as a portrait of contemporary family life quickly unravels into a meditation on the borders between digital and physical existence and the future of this brave new world being created. 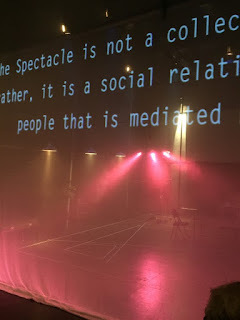 Flashing Lights combines a fantastical absurdist narrative with a highly physical theatrical style using technology like smart phones and tablets as puppets, masks, light, and sound sources. Drawing on the ideas of Marshall McLuhan, Sherry Turkle, Jean Baudrillard and other theorists, the play speaks to the growing anxiety about the future and to the vertiginous feeling that time itself is speeding up. Will humankind’s frail, flesh and blood selves be able to keep up? When you walk into the theatre, you find the stage is shrouded with a see-through netting that can have images projected upon. This is used very effectively throughout the production. It took me about fifteen minutes of this ninety minute play to grasp exactly what is taking place. I don't want this to scare anybody away from seeing Flashing Lights, as I found it quite interesting to watch. The starts starts with a very dysfunctional family at breakfast, all caught up in their own worlds of the Internet. Peter just wants to eat his cereal. Shannon, his wife, dreams of creating a new social technology, Omni which puts people inside of technology as she believes bodies have now become useless. Their daughter, Ter, wishes to evolve with the use of the 'net and do so quickly. Peter becomes famous, though, and we watch him go through his fifteen minutes of fame, then what becomes of him afterwards. Flashing Lights is an interesting, thought provoking play, and is full of emotion. It is definitely worth seeing.